If you are a celebrated movie star who has done countless hit movies and television series, how would one of your most important videos look like? That is the most anticipated question which was put to light when the dubbed ‘royal couple’, Marian Rivera and Dingdong Dantes released their prenup video days before their royal wedding. A four minutes and forty-two seconds AVP was posted on YouTube by Nice Print on Christmas day and was surely getting a lot of attention from the viewers. 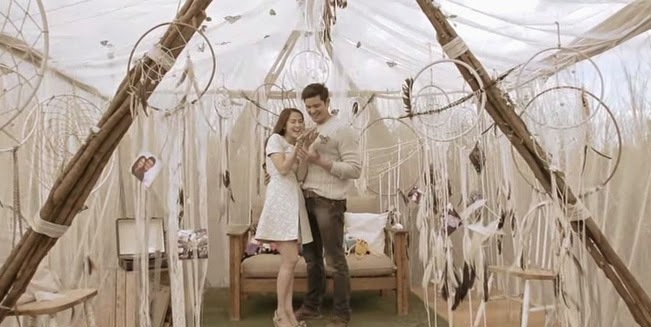 On the prenup video, Dingdong was seen riding a Ducati motorcycle while Marian was driving a luxury SUV. The couple meet halfway then travelled on foot to a small sanctuary of their memorable photographs and some butterflies, which became an important symbol of their relationship. From luxurious ride, the video took a sharp turn when they reached a community where they mingled with children and adults alike, showing their more ‘down-to-earth’ side. The video ends when a tricycle with attached tin cans took them away. Marian Rivera and Dingdong Dantes are going steady for almost five years when the latter proposed in Macau on August 2012 and in public during Marian’s show after two years. The couple is set to tie the knot on December 30, 2014 at Immaculate Concepcion Cathedral, Quezon City. Friends from both politics and showbiz would make up the Rivera-Dantes nuptial entourage. Since the video has really more of a ‘pang-masa’ theme, it could not be helped noticing how there seemed to be a political intention on the said prenup video. Talks of Dingdong Dantes joining politics had been going for a while since the powerhouse couple went hand in hand to endorse the then presidential candidate and now leader of the Philippines Noynoy Aquino. When asked about his political plans in the future, the couple has not denied or confirmed any.